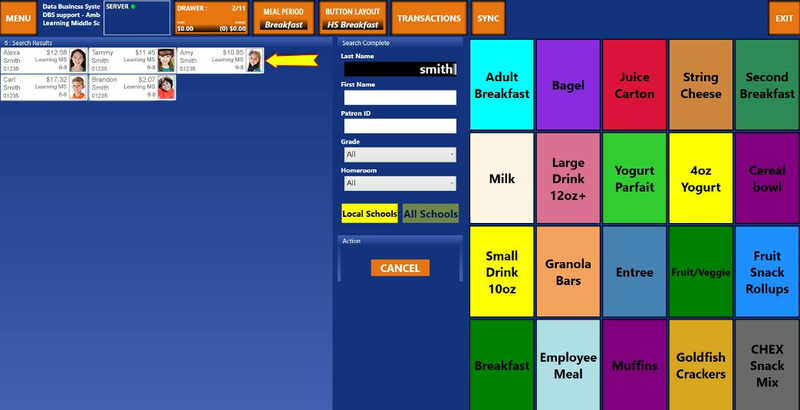 QuikLunch is a point-of-sale application that is designed to streamline school cafeteria services. From everyday full-service meals to bulk classroom sales, and even system-wide updates and reporting, QuikLunch makes it easy to process and maintain all cafeteria data transactions. As a member of the School Office Suite®, QuikLunch is fully integrated with Administrator’s Plus so data flows seamlessly between the two systems. QuikLunch can also interface with PayForIt.net and QuikApps to keep student balance records, free/reduced meal eligibility, special dietary or nutritional needs information accessible and up to date. Lines: Automatically populated by digital input devices such as PIN pads and Biometrics. If more than one line is in progress, each line will have its own tab on the screen according to screen size. Roster: Use a pre-composed roster list of students that is created by the Administrator. Grade: Load all students in the selected grade level. Classroom: Load all students in the selected classroom. Search: Students' names can be individually looked up. Any student matching the search criteria will be shown in the “line” area on the screen. Dedicated action buttons can be used to switch between sales modes like Full Service, Bulk Select, Item Sale, Tap to Sell, and Biometrics. Full Service: default mode to process sales like normal. Bulk Sale: sell item(s) to a group of students. Free, reduced and denied student counts are collected all at once so insufficient or unqualified accounts can be excluded. Tap to Sell: One-touch meal sale per individual. The full meal is automatically applied to their account for fast check-out. Biometrics: Works with a biometric device to automatically identify each individual via finger print scan. The identified student's information is automatically displayed so the transaction can be completed on their account. PayForIt.net (PFI), a secure online web portal that works with QuikLunch. QuikApps is an online tool designed to help parents and guardians navigate through the application and verification process for free or reduced meals.